I wove a few yards of fabric in shadow weave using woolen yarns I found in my stash, and from this fabric I made myself a new pullover. I haven’t made a new one in a long time because the old ones seem to last forever! Shadow weave seemed like a good choice because its mostly plain weave structure would work well with these yarns to produce a lightweight, felted fabric after wet finishing, and also because there are so many patterns you can design in shadow weave by alternating light and dark or contrasting colors of yarns. Shadow weave falls under the category of color-and-weave and is considered to be a color-and-weave effect. Notes on weaving the fabric for the shadow weave woolen pullover: I used a 2-ply heathery purple/blue woolen yarn (272 yds./4 oz. skein, “Regal” from Briggs & Little Woolen Mills) and a beautiful, single-ply brown/black woolen yarn, I’m not sure where I bought it years ago, the label says on it “Black Welsh, 1/5-1/2 YSW.” These two yarns alternate in the warp and the weft at a sett of 8 e.p.i. and about the same p.p.i. The width of the web on the loom was 28 inches and the total woven length about 3-1/4 yards. I wet finished it in the washing machine in warm/hot water with Ivory for wool, agitated only two minutes, rinsed, and carefully spin dried it. I put it in the dryer on low heat for about 12 minutes and then let it air dry until it was completely dry. The end result was a slightly felted, lightweight fabric, 22 inches wide and 3 yards long. 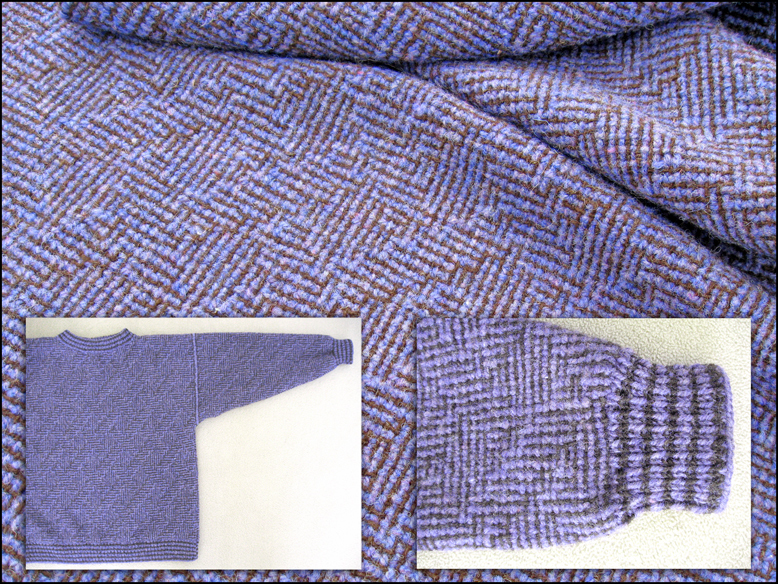 The construction of the pullover was fairly easy because of its simple design. I cut out the pieces, serged the raw edges, sewed the pieces together and knitted the hem, collar, and cuffs. By the way, Laura Fry is an expert on wet finishing and I treasure her book, Magic in the Water, with real woven swatches attached, great tips, and excellent information. 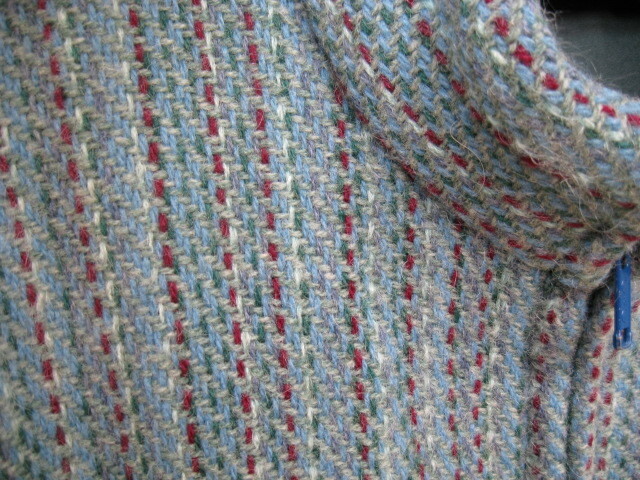 For more about weaving with woolen yarns see one of my older posts, 2/2 Twill: Handwoven Woolen Wearables. 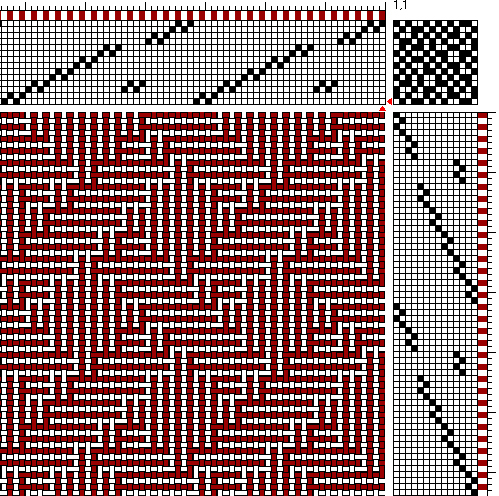 There are other methods of designing shadow weave than the method of using independent blocks of log cabin that I used to design the pattern for the red and white sample and the pullover. The Atwater method uses alternate threads for the basic pattern and the threads that form the “shadow” are threaded on the opposite shaft. 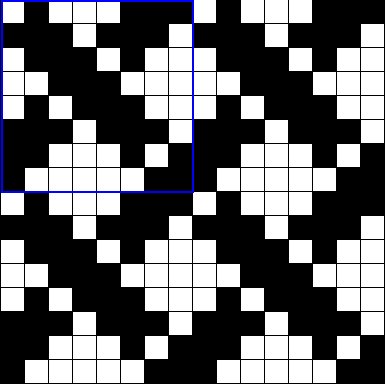 The Powell method uses a twill-step sequence and two adjacent blocks weave together in the pattern. 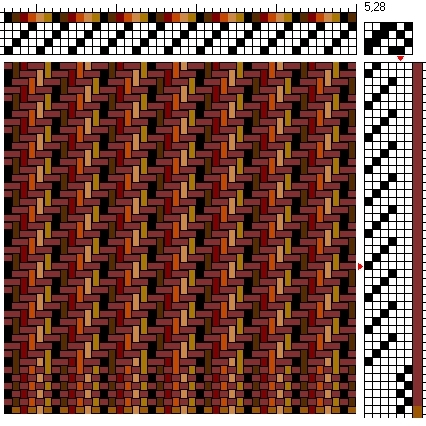 Carol Strickler explains it in detail in A Weaver’s Book of 8-Shaft Patterns in Chapter 6 on shadow weave. She writes about Mary M. Atwater who introduced shadow weave in the 1940’s and Harriet Tidball and Marian Powell who later developed other methods for designing the same fabric. 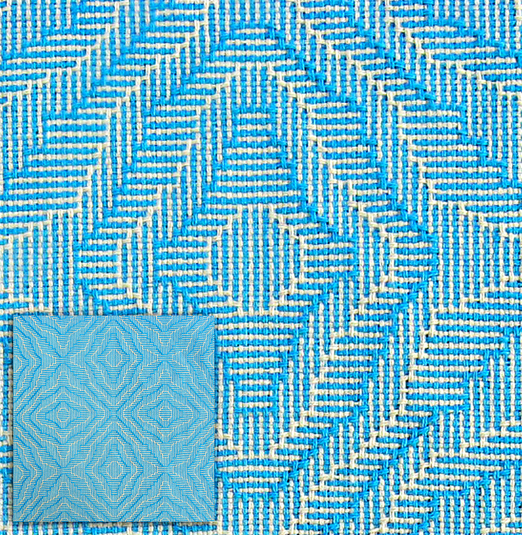 Drafts for 8-shaft shadow weave cotton sample – Atwater method on left, Powell method on right, two methods, same result! Marian Powell first published her wonderful book in 1976 without the aid of weaving software. Some weavers find it a little hard to decipher. If you’re a weaver and need help with Powell’s book or would like the WIF files for any of the drafts in this post, let me know. Season’s Greetings and a happy and healthy New Year to my readers who visit from all corners of the world! 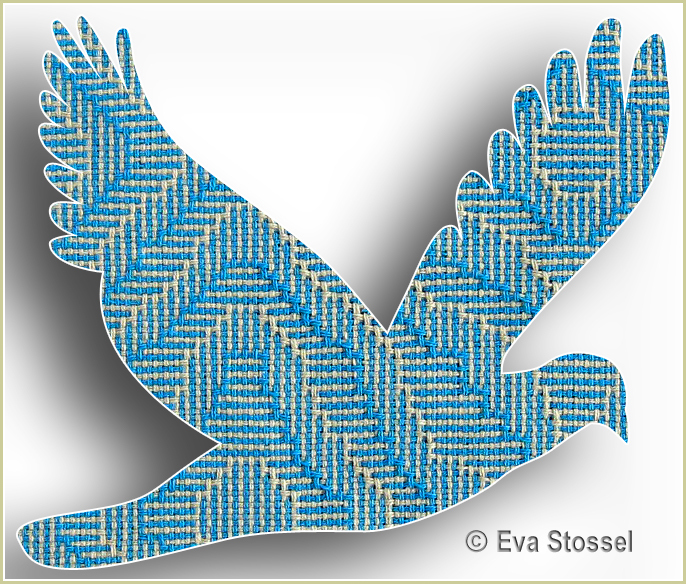 Thank you for visiting and wandering around in my weaving universe! 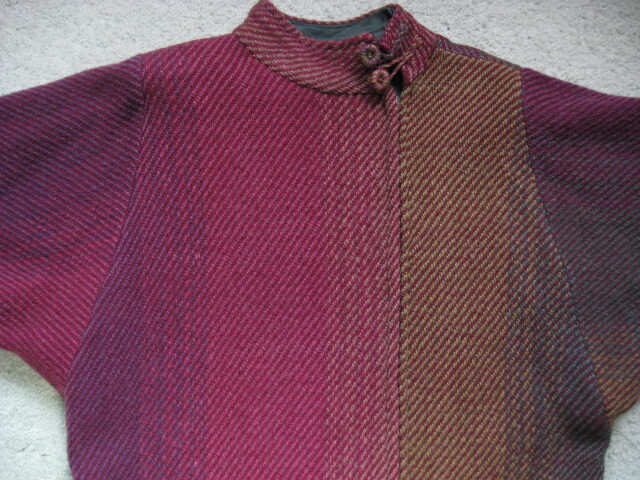 Over the years I wove different types of woolen fabrics for jackets and pullovers. I often used 2/2 twill and woolen yarns, sometimes with a little bit of mohair mixed in with the warp. Woolen yarns are made up of short and long fibers lying in different directions and the yarn is usually soft and fuzzy while worsted yarns are made up of long fibers all lying parallel to each other and the resulting yarn is compact and smooth. Woolen yarns are great to use to get a finished fabric that is felted, and the amount of felting depends on the finishing process. Below are images of two jackets, a pullover, a weaving draft and notes about how I finished the woolen fabrics. The jackets are a product of my collaboration with a friend, a professional seamstress, who used commercial patterns to sew them from my handwoven fabrics and lined them with commercial cotton fabric. The pullover is entirely my own creation, including the crochet finish. Because the weave structure is simple I emphasized color and texture in the designs to make the fabrics more interesting. To weave the fabric for this jacket I dyed medium weight woolen yarns for the warp in several batches of colors using fiber reactive dyes. 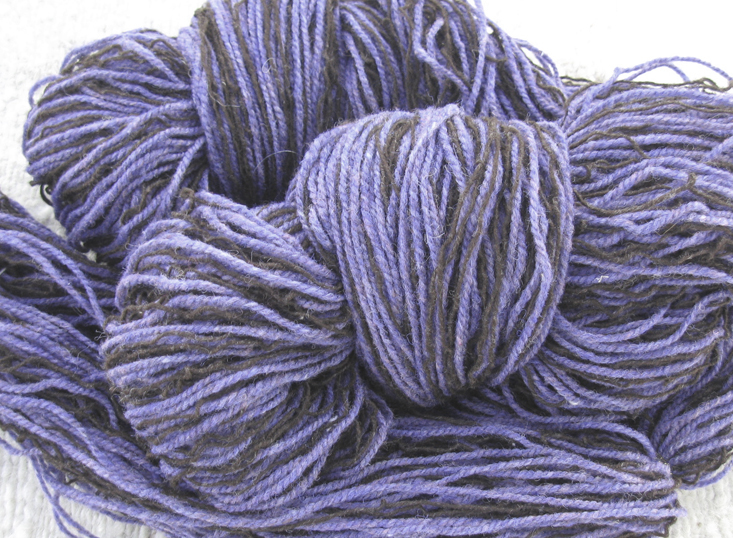 I used a lighter weight woolen yarn that was already dyed for the weft. The sett was 10 e.p.i. The total width on the loom was 48″ and after the finishing process it was reduced to 40″. 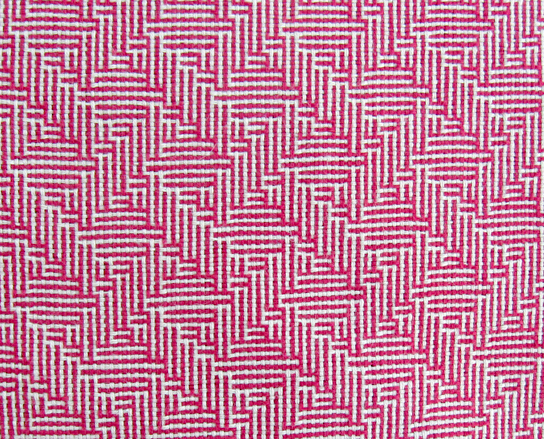 I wove many yards of this fabric, enough for several jackets and each jacket used up about 4 yards of fabric. This is my favorite jacket, I’ve been wearing it in the Fall for the past 25 years and it’s still in great condition. The woolen yarns in this jacket are lighter weight and the sett was 12 e.p.i. I mixed in the warp some mohair yarn, about 1 in every 6 warp ends is mohair. The yardage width and finished fabric is similar to the other jacket, but my seamstress friend used a different pattern. She did a great job, and my husband still enjoys wearing this jacket on a cold day. I sewed this pullover myself because its construction is simple. To weave the fabric I used lightweight woolen yarns, 6 warp ends in a paddle, and every sixth end was black mohair. 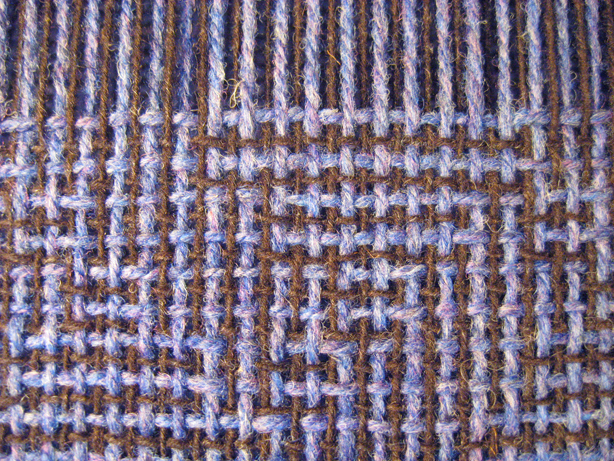 The weft was a singles woolen yarn that I doubled up. The sett was 12 e.p.i. and 30″ wide on the loom that was reduced to 24-1/2″ after the finishing process. Less than two yards of this fabric was enough to make the pullover: it’s about 24″ long, the main body required 48″ and the sleeves required 18″ for both. The only cuts in the fabric were at the neckline, sleeves and bottom. I serged using an overlock sewing machine any raw edges and used a regular sewing machine for all the seams. To avoid any bulkiness where the sleeves are connected to the main body, I zigzagged the pieces together as they lay side by side and then used some woolen yarn in a large blunt needle to do overcast stitching over the join for a more attractive finish. The final touch was crocheting around the neckline, cuffs and the bottom. I finished (scouring and fulling) all the yardages for these jackets and pullover in a similar way: After removing the web from the loom, I put it in the washing machine on gentle, warm water with a little bit of detergent (neutral/alkaline pH – most detergents are good), agitated for only 3 minutes, warm water again in the rinse cycle for about another 2-3 minutes, spin cycle to remove excess water, and then placed in the dryer on low heat for about 30 minutes until dry. This produced a fabric that is just a little bit felted, easy to cut and sew and wonderfully warm to wear as a finished garment. You need to experiment with the amount of time for agitating in the washing machine and trying different drying methods to see what works for you. 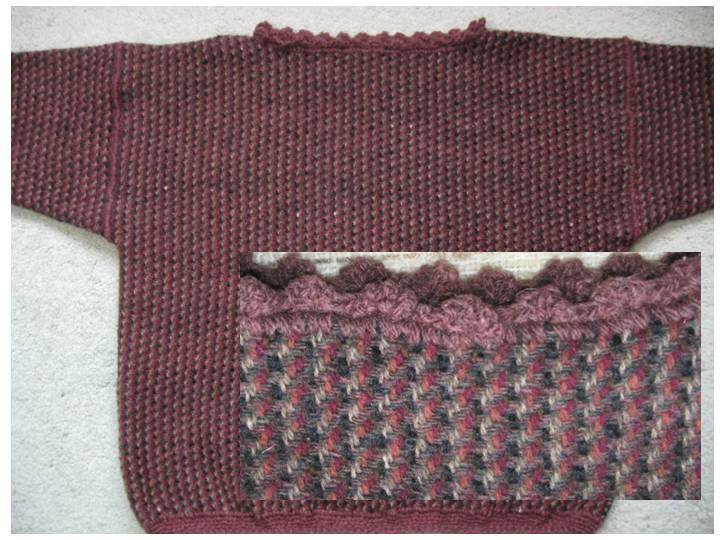 There are a series of related articles on the topic of finishing wool fiber and textiles at fiberarts.org. I especially like the article, “Washing Wool Fiber and Textiles” by Tom Beaudet and the article, “Wet Finishing – A Warm Winter Coat” by Laura Fry.